Earlier this week we had the first-day-of-rehearsals “meet and greet” for the third show of the season, Samuel Beckett’s Happy Days. The production, starring four-time Best Actress Oscar nominee and renowned theater actress Marsha Mason (pictured at left) opposite Cal Shakes Associate Artist Dan Hiatt, is directed by our A.D., Jonathan Moscone, and boy is he excited about it. Apparently he’s had a crush on the Goodbye Girl since he was a lad—luckily for him, Ms. Mason’s former stepdaughter was one of his BFFs for a time. So now, he says, he’s realizing a longtime dream in directing her. Despite Moscone’s very public statements of nervousness over tackling Happy Days, his explanation of the title shows his sheer excitement at digging into the work. For those of you who don’t know, Happy Days features a middle-aged woman, Winnie, dressed in evening wear and buried “up to her diddies,” as she says, in earth. A blazing, never-setting sun is overhead; Winnie wakes to the sound of a bell each day, although the concept of a “day” seems somewhat unrealistic in this setting. But it is a “happy day,” says Moscone. “The title is not ironic. Winnie is finding joy in her day.” She goes through the items in her purse, tells ribald tales to her largely unresponsive husband, Willie, and, as the director puts it, “emanates the light and the heat and the experience of her life, continuing to move forward amidst stasis.” And her hourglass seems to be at its tipping point: Her bottle of tonic is almost empty, her tube of toothpaste is about to run dry, and her umbrella bursts into flames. Something, on this day of all days, is about to change. To create the possibly post-apocalyptic environs of Happy Days amid the hilly splendor of Cal Shakes’ Siesta Valley home, scenic designer Todd Rosenthal—awarded with a Tony earlier this year for his August: Osage County sets—is working closely with Moscone and Mason to to create a sort of shoebox full of dirt and debris that has been tipped over and spilled (pictured at left). Among the spillage will be signs of life: perhaps a radio, a dresser, lamb, a Radio Flyer wagon that Willie may rest upon, lean against his own past. 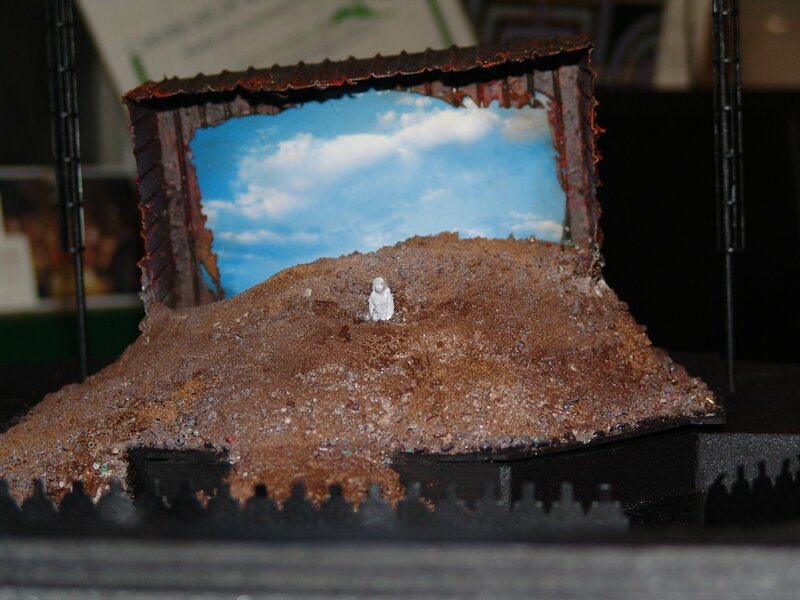 And inside the rusted metal diorama will be a bright, too-blue sky. This entry was posted in By Stefanie Kalem, Main Stage and tagged "Happy Days", "Marsha Mason", "Samuel Beckett", California Shakespeare Theater by calshakes. Bookmark the permalink.